Boy o' boy, these were delicious and so frickin' easy to make! 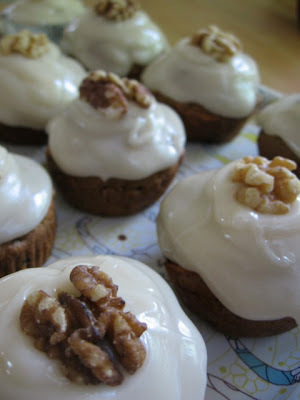 I stumbled on this recipe on Have Cake, Will Travel's blog. I followed her advice and made 'balls', instead of pressing them into bars. 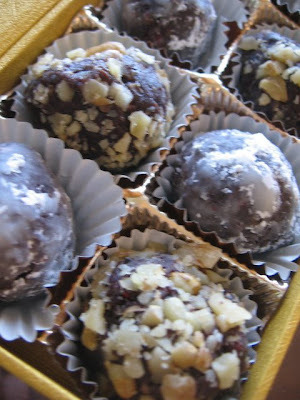 To make them look pretty, I rolled some in powdered sugar, cocoa powder and chopped walnuts. I had a leftover chocolate box that I used to place them in and give as a gift. My friend couldn't tell that they were, raw or vegan. I love when people find out that treats I make are vegan and healthy! It definitely brightens my day! She thought she was indulging in some super sinful goodness. 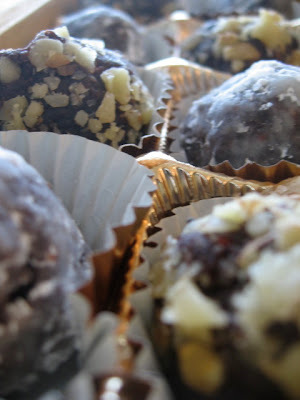 Granted, they are a full serving or rich (but healthy) goodness! Over Memorial Day weekend I went to Madison to visit my sister, Emily and her husband Eric. E & E, as they're know in my family. They're probably the cutest couple that has roamed the planet since dinosaurs. I'm guessing at one point there was an adorable Brontosaurus couple... Ok, enough dino-talk. Anyway, they ran the Madison half marathon. It was a ton of fun to see them as they prepared over the last months and have the opportunity to see them run. My Mom and other sister, Amy were in town too, to watch them run. The three of us had a blast running from mile marker to mile marker to root them on. We were boarder line embarrassing with all of our hoop n' hollering and encouraging comments, "Dogs are chasing you, move it!" They finished under their goal time and even looked as if they were having fun while running. Pretty cool! 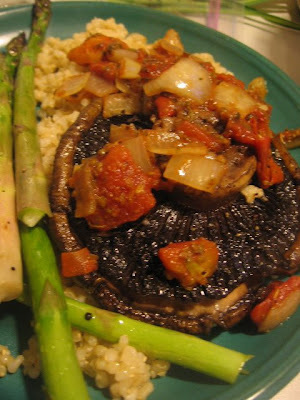 The night before the race we grilled some portobello caps, roasted some fresh local asparagus and had some brown rice with a tomato sauce. Healthy nutrition for a pre-marathonin' meal! Either way, I'm so proud of them. They have both inspired me to start training for a 1/2 in August. Thanks for being such an inspiration, I love you guys! Who doesn't love carrot cake? Carrot cake is great anyway you have it; served in spring or fall, at birthday parties or baby showers, with nuts or without-- It's one versatile cake! My oldest sister loves carrot cake, she even served it at her wedding. When I found out she was coming into town a week after her birthday I was knew I had an opportunity to make some sort of baked goodie. 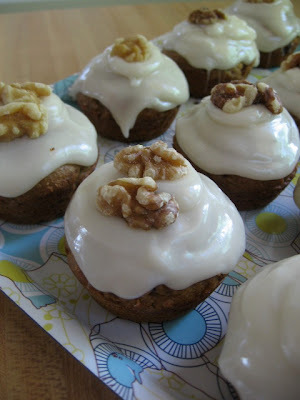 Carrot Cake Cupcakes! 1 tsp ground ginger-- Crystallized ginger might be a tasty mix in too! Preheat oven to 350 degrees. Makes about 15 cupcakes. Add the dry ingredients together and mix well. Mix the applesauce, egg replacer and vanilla in another bowl and slowly add into the dry ingredients. Once mixed, add the carrots. Feel free to add any raisins, walnuts or any other mix-in you'd like. Spoon into cupcake liners or right into the muffin tin. Bake for 15-20 minutes until done. Test with tooth pick before letting them cool. After they have cooled, frost and enjoy! 1 tub of Tofutti 'Better than Cream Cheese' -- Try to find the one in the yellow container, this one does not contain hydrogenated oils. With an electric mixer, mix the 'cream cheese' and vanilla. Add cup by cup of powdered sugar until you've reached the right consistency you'd like to work with. I lost count on how may cups I added, I'm pretty sure I used 3 and maybe 1/4 cup more? Be your own judge and taste the glaze mixture until you've found a consistency you like. Summer! 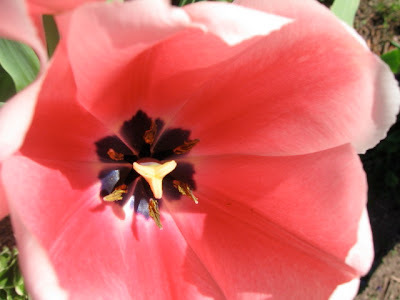 Warm weather, pretty flowers, green grass and sweet smells are all here! Finally! We got so much snow this winter I though I'd never see grass. 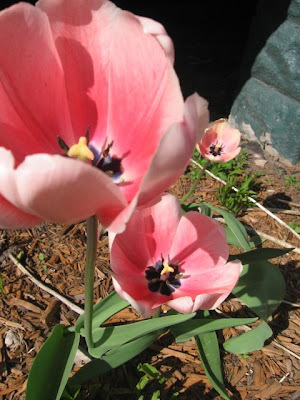 Tulips in the front lawn- Beautiful! Finals were last week and now a thing of the past. I'm deffinately in for some major relaxing. 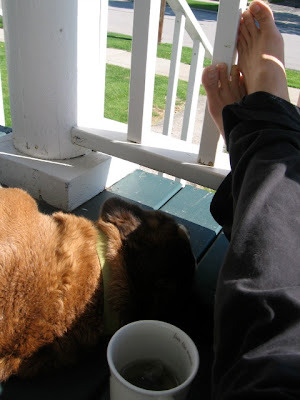 B's and I started our summer off right by spending some time on the porch drinking tea this morning. It was so peaceful; a great opportunity to just be still. We'll have many more mornings, afternoons and evenings doing this I'm sure! Doo, doo, doo, lookin' out my backdoor! I went to visit my Mom and Grandparents for Mother's Day this year. It's always a delight to catch up with them. My Mom and I prepared a jicama salad with black beans, corn and peppers-in a mustard cilantro vinaigrette. It was so fresh and flavorful! I had the leftovers finished before I even got home! She won't give me the recipe because she makes it at the Bakery she cooks and bakes at. She is pretty good at keeping secrets! 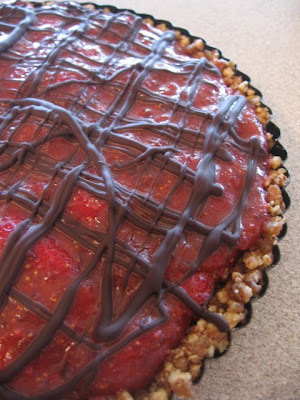 We finished lunch off with the No-Bake Strawberry pie from The Joy of Vegan Baking. Soo so good! The recipe in Colleen Patrick Goudreau's book, The Joy of Vegan Baking advises shaved chocolate to top off the pie- follow the recipe! I drizzled chocolate over it which made it difficult to slice into pieces. Either way, it was healthy and so tasty. Go on! Thank your Ma' and Grandma for changin' your diapers and bringin' ya up right! This dish is healthy, loaded with vegetables and holds some pretty dank flavor. Make the pesto while the squash finishes baking. Let the pesto simmer on a low heat to keep warm while you shred the spaghetti squash. Garnish and serve with a whole lotta' love! 2-3 garlic cloves- Depending on how much gaaa-lic you can handle! Blend everything together in a processor or blender. Feel free to add some reconstituted sun dried tomatoes to the bean mixture and then add some whole ones to the sauce before serving. Thin the sauce with some water while it simmers on low. I added some peas to the sauce before serving- a signature touch! Serve up over noodles, rice or enchiladas-- Whatever! Have fun!